The Elasto-Gel Heel/Ankle Boot is a flexible, adjustable boot that offers full protection for the heel, foot and ankle bones (lateral and medial malleolus). Pad and protect your heel, foot and ankle with the Elasto-Gel Heel/Ankle Boot. The new boot with removable gel insert, distributes weight away from bony areas and relieves pressure. The gel insert is fully adjustable within the boot to allow total coverage where desired. Comfortable and easy to use. In addition, the gel provides thermal properties which allow the application of hot or cold therapy. 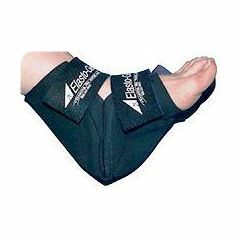 Having experienced a good many injuries in my time, I've had a chance to use lots of Elasto-Gel products. Although this one is reasonably well built and comfortable, the cooling gel portion of the Heel/Ankle Boot seems rather skimpy compared to other Elasto-Gel items (cooling lasted about 15 min). I think the Elbow/Knee wrap might have worked just as well and can be used on other areas of the body more easily. I tried using it each night, but it didn't really work for what I needed. The "cool" lasts long enough to penetrate the deepest part of the joint without causing freezer burn. i ware a 11/have shoe what size would you recomend.